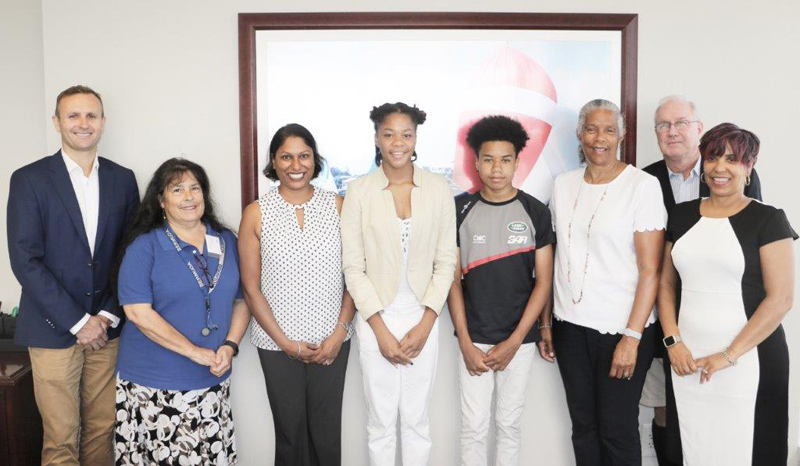 Two students have been awarded scholarships by the Bermuda International Shipping Association [BISA] to sail on one of the Spirit of Bermuda’s summer voyages for students. Massassi Smith and Quentin Vaucrosson were selected as this year’s recipients. Both students said they are very pleased to be given another opportunity to sail on board the Spirit and are very much looking forward to the experience. The scholarship entitles the students to participate in the Youth Skiller Voyage where the students circumnavigate the island and have an opportunity to enhance their navigation, seamanship, teambuilding and leadership skills. Branwen Smith, Chief Executive Officer of the Bermuda Sloop Foundation thanked the Bermuda International Shipping Association for supporting the Spirit of Bermuda’s summer Skiller Voyage program. She said, “Massassi and Quentin are very deserving of this scholarship; they both have demonstrated outstanding leadership abilities. This award will help them improve their sailing skills. The Spirite should be sailing from Bermuda to the Azores, Uk, Spain, Africa, South America, Caribbean, east coast USA, Nova Soctia back Home. Open it up for all the World to sail. You can do one leg or all of it. Gaining creditable knowledge and certification towards a Captains license. The myth of government school children play for free is just that. We pay per child. There are sail training ships passing though our Island and working it. This is our History! Moving kids from Dockyard to St. George is more of stipend to prolong the inevitable.